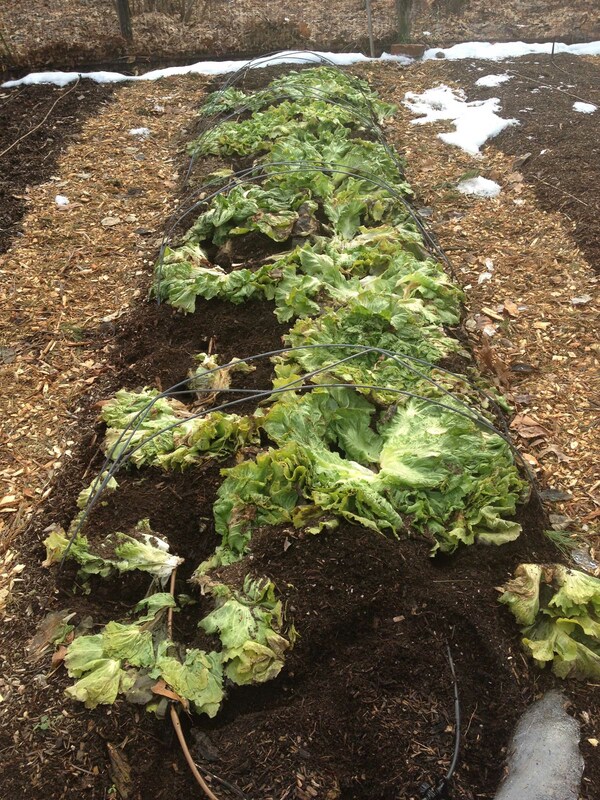 Despite rain, some snow, and temperatures that dipped below 10°F, the whole bed of endive was lush and green. A low tunnel of porous, light fabric and clear plastic held aloft by wire hoops kept the worst of the weather at bay. As I reached in to harvest a head, no knife was necessary; the head lifted, unattached, off the ground. Mice have been at work again! If it’s not one thing, it’s another. A timely sowing of endive seeds (early July) gave sturdy seedlings that were transplanted (early August) into compost enriched soil to present (by September) a beautiful bed of wall to wall greenery. 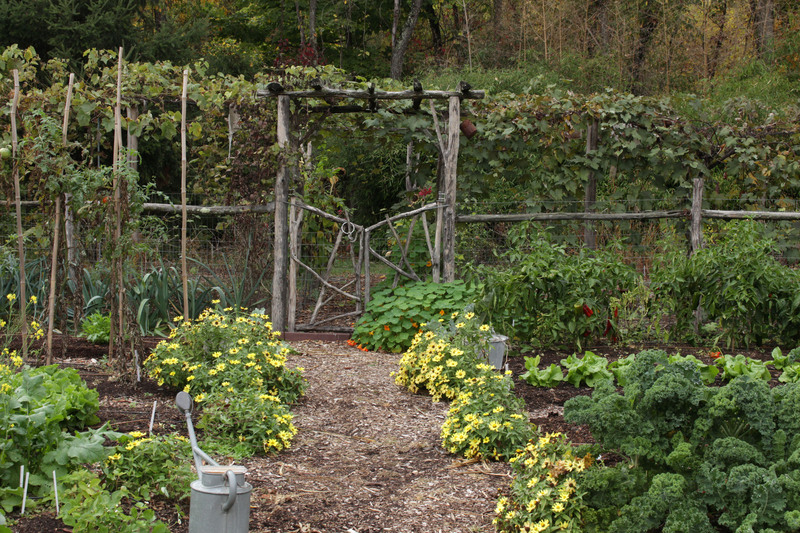 The beds were covered for cold protection in November. What a cozy home that bed became for mice. The tunnel provided not only food and lodging but also cover from the hungry eyes of local hawks. The mice ignored endive’s leaves, instead devouring the stout, fleshy portions of root and stem at the base of almost every plant. Note to myself: Next fall pre-empt mice by getting a supplemental cat or two and/or setting traps within wooden boxes having mouse-sized entry doors. Another note to myself: Replant clematis. Over the years I’ve accumulated a number of varieties of clematis. The vines barrel up and over fences and trellises clothing them in sumptuous blooms. Blossoming has diminished over the years, the culprit being clematis wilt, a fungal disease that turns leaves and stems black. It doesn’t usually kill the plant but a clematis without flowers and with blackened leaves and stems is not a pretty site. Clematis and I are not finished. In the next few weeks I must sit down and seek out sources for native clematis species and their hybrids. Their flowers are smaller but they are resistant to wilt. Scarlet Clematis (Clematis texensis) is definitely on my list, as is Rock Clematis (C. columbiana, sometimes listed as C. occidentalis var. columbiana), and the hybrids Betty Corning and Étoile Violette. The choices don’t stop there because two breeders on the other side of the Atlantic have come up with a whole series of wilt-resistant clematis, known as Evison-Poulsen series. More notes to myself on plants to grow and not to grow next year. Zahara Yellow zinnias in last summer’s garden. My zinnias looked a little unusual this year, unusually pretty, each flower with a single row of yellow petals radiating from a brown eye. Also unusual in being very compact, long lasting, and not marred by the powdery mildew of most zinnias. Last year I had just a few of these hybrid Zahara Yellow Improved zinnias in the vegetable garden; next year I’m planning for enough to make a bold, yellow line along each edge of the main path. 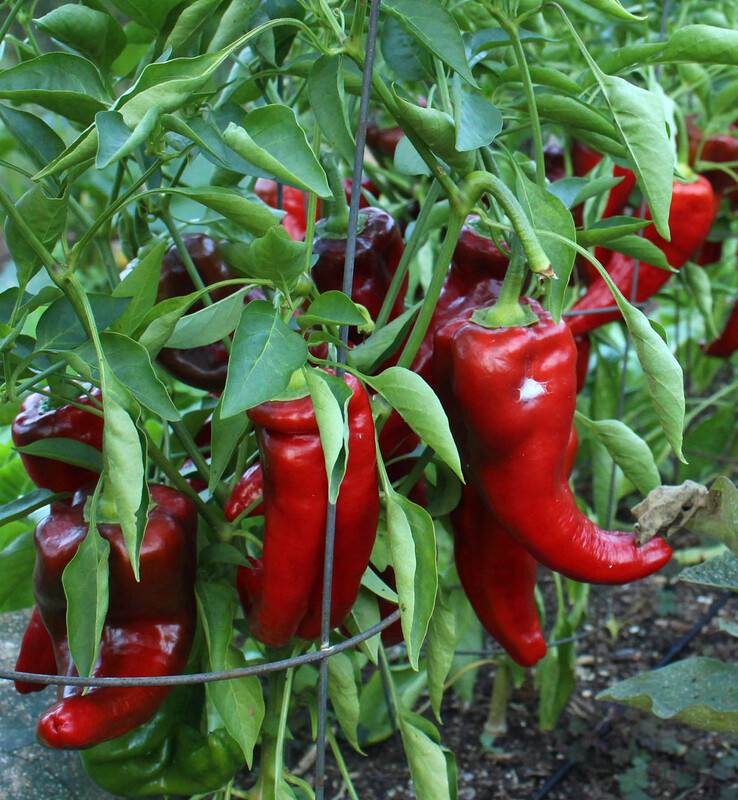 It was a great year for peppers, and the greatest, for flavor and production, were Carmen, Sweet Italia, and Pepperocini. Great for production but not so great for flavor was King of the North, which won’t be invited back. In its place, I’ll be inviting Bridge to Paris pepper, recommended by a knowledgable friend. 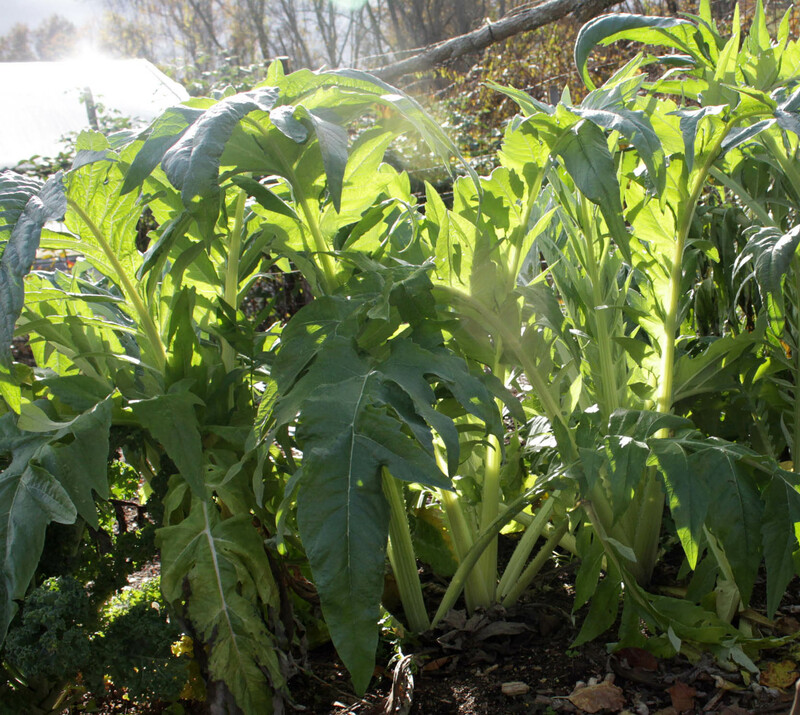 Cardoon, the variety Hunchback of Nice, was better than expected but not good enough to justify the growing again of last season’s 10 plants. Each plant is bold and striking with upright, to 3 feet or more, blue-green leaves, so my plan is to grow only 2 or 3 as ornamentals from which I’ll steal occasional leaves for eating. Meserve holly bushes that I planted many years ago have grown large to create a solid wall of lustrous, spiny leaves. That’s nice. Even nicer would be red berries against that verdant backdrop. Close inspection of the flowers last spring indicated that all the plants, contrary to what was ordered, are females. One male, which I will order, can sire them all so that in a few (very few, I hope) years, red berries will liven up the scene in winter. I completely forgot to plant ginger this year. Yes, ginger, that tropical plant which has captured the interest of many small farmers. I could never understand the big deal about ginger until I experienced the tenderness of freshly harvested, red blushed baby ginger. Not that mature ginger could anyway be harvested in the short growing season this far north. My plan is to buy a ginger root in March, divide it up and pot up each section, then keep the pots warm and moist to give the roots an early start for a good harvest of baby ginger. Brussels Sprouts, the variety Gusto, were a rousing success, perhaps too rousing because we still have 6 stalks perched in a bucket in the cool mud room and awaiting dinners. Four to six plants will be plenty for next year. Not every vegetable needs to be loved by everyone. Next year, and in years hence until I forget what they taste like, I will not be growing broccoli or beets. This entry was posted in Fruit, Gardening, Pests, Planning. Bookmark the permalink. Trackbacks are closed, but you can post a comment. « NICE HIPS, BUT WHOSE? Where are you acquiring the variety of ginger to grow to comsume? Is there a certain variety that is edible, as I have seen some varieties at big box stores for sale that are being sold as flowering ornamentals. Are these also edible? Can I just buy a root from the grocery store? I very much enjoy your web posts. Thank you very much! Get it from a grocery store, not one of those ornamental ginger plants. I have Clematis texensis ‘Princess Diana’ and it gets wilt but it is still one of my favorite clems. I have noticed that some clematis seem to outgrow the disease and after a few years in the ground they don’t get it any more. Diane in Jay here. Love your thoughts, Lee. I have issue with voles and mice which vex the heck out of me both inside my basement and outdoors. I did use a granulated repellant from Garden’s Alive last year and it seemed to do the trick for the whole season, but now they are back, with their tunnels evident along every raised bed edge. Our house, which has a portion of old foundation/dirt flooring/turned root cellar is super cool for storage, but so far the field mice have eaten on squash and gnawed the outer leaves of my cabbage. Our traps catch them on a regular basis, but I am at wits end to protect my harvest!!! I even went to sewing cotton bags to hang to keep them up and away from the critters, but they apparently can shimmy down the cords and gnaw the bags. also, I am interested in learning more about this baby ginger feat. Any more specific info posted anywhere? I love fresh ginger and would never have thought it possible to grow my own–Jay is zone 4, I think you are 5 in NP? one last thing: have you ever grown cipollini onions? I have only grown regular onions from sets, and I grow loads of hard-neck garlic, but my eye caught these little flat onions and I am wondering if they are worth the work to start from seed? I can only imagine the size of the seeds!! The size of onions is also related to their spacing. The Cippolini seeds probably aren’t small; the onions are probably just planted closer (and are inherently smaller). Yes, I’m in zone 5, the colder part of zone 5. Ginger probably needs a greenhouse in zone 4. For mice, google something like “water bucket bottle peanut butter mouse trap”. Very effective, and repeating. Unless you dislike the color, Zinnia ‘Zahara Sunburst’ is very nice, too. I’ve grown it for two years…tons of flowers until frost, without a hint of mildew. Really interested in those Clematis varieties. I planted Clematis Virginiana – wow! It has nearly covered the North side of our garage/workshop. However, I did not see any seed heads? The flowers were covered in bees and the like so I know were pollinated. I was looking forward to those fuzzy seed heads. I can’t imagine that anything would eat every last one? Any ideas? Also extremely interested in the ginger! I want to try growing ginger. 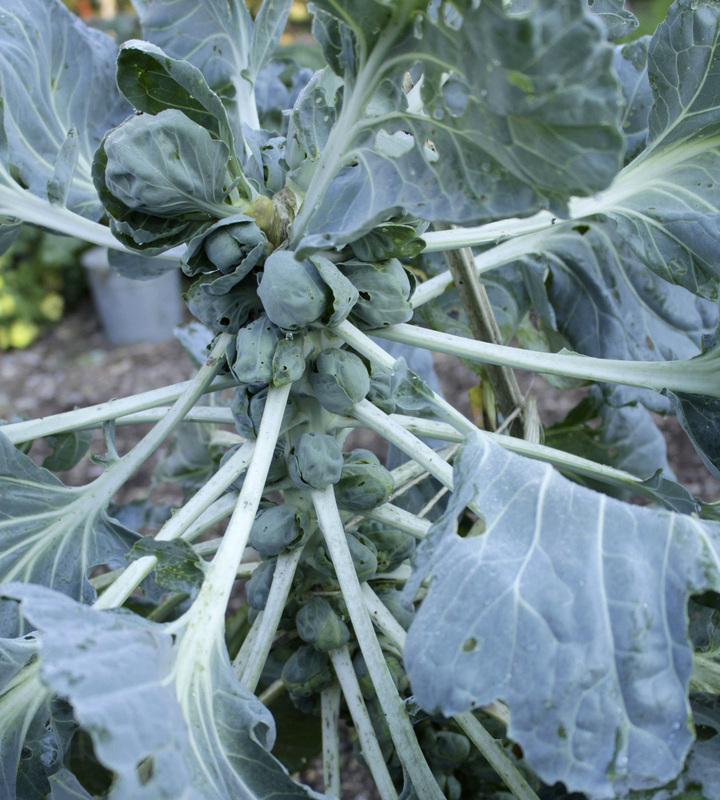 I never grow broccoli – too much for too little but I do enjoy broccoli rabe. I’m giving up beets, too. Sorry about the mice! I think an owl or fox would be better than a cat. Cats kill birds. I have strays or neighbor’s pet cats that terrorize my garden. It is upsetting. Although my rabbit herd did disappear. Hope you are enjoying our current snowfall. Its quite pretty here. I am interested in where you source the ginger root. Can a good piece from a grocery work or do you go somewhere else? Also as a my mother is in Arizona, I thought I might start a bit for her. She might enjoy that as she likes fresh ginger also. Oh! I have been looking to purchase a good fig or two, so perhaps I can take a Rabbi Jr. off your hands in the spring. I’m loving the snow and have been enjoying it on skis. I started my ginger with a piece of root from the grocery store.